Visit with Norman Bridwell, the creator of Clifford, the big red dog, featured in 80 bestselling books. It doesn't take much to make a big impact. Volunteer to tutor or read to a child, or listen to a child read to you. Annette Bening, the host of the second program in this Reading Rockets series, is an award-winning actress and mother of four children. It seems a miracle that any child can learn to read. We ask kids as young as five to understand that what look like scribbles on a page are really symbols and that these stand for sounds, which correspond to letters, which make up words, which combine to form sentences. "It's amazing that they can figure that out," says teacher Gail Fischbach. Want to know more? 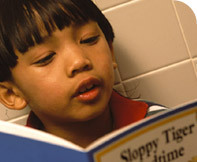 These articles show how to build a child's basic reading skills. Read and watch our interviews with some of the nation's top reading experts. Here are some of our favorite websites on preparing children for school.